The Rivoli tool is made from machined steel hex bar stock. This is how it works. The chain lies vertically, over the 2/3 height chain rest farthest from the rivet pusher piece. The roller rests in a contoured trough with the rivet to be extracted available to be pushed by the black steel pin at the end of the pusher piece. As the pusher piece is turned clockwise, it slowly advances forward to the rivet, makes contact and pushes it out of one outer link plate, then the inner link plate, through the roller, then the inner link plate on the other side. The chain will now come apart in your hands. To re-install the rivet, the chain is put vertically in the tool, this time with the previously extracted rivet facing into the black steel pin. Turning the pusher piece this time inserts the rivet. Cyclo Rivoli make two models of chain tools, the original "standard" model comes in a Silver box, is all Silver in color, and works well with all chains that have flat outer link plates. The other is the "narrow chain" model, which comes in a Green box. 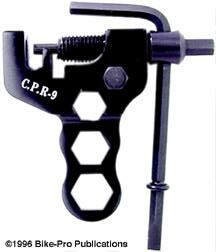 The narrow model is for use with Hyperglide or other chains, which have rounded outer link plate. The narrow model is Gold in color, and has additional milling performed to it, to accommodate the rounded outer link plates found on many narrow chains. Both models weigh 83 grams, and both come with a spare steel pin. Although their are now several multi-tools now available, this was the original. Produced in Taiwan, the Cool Tool is made entirely of steel and has 8 distinct tools. The most obvious is its adjustable wrench that opens to 20mm (3/4"). The jaws are thin so it can be used as an adjustable cone wrench. The handle section of the adjustable wrench is the anvil of the chain breaking tool which is made to take apart narrow, even HyperGlide chains. 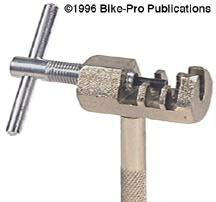 The back of the chain anvil is a spoke wrench. The steel pusher piece of the chain tool, has two holes through it. Both holes are hex shaped, one is 5mm the other is 6mm. Each of the holes is used to hold a hex wrench. 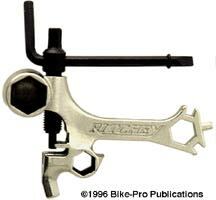 The 5mm wrench has a 4mm hex on the long side and is 5mm on the short side. The 6mm wrench has a #1 Phillips screw driver on the long side. The remaining tool is the 14mm socket which is held to the tool by the pusher piece. 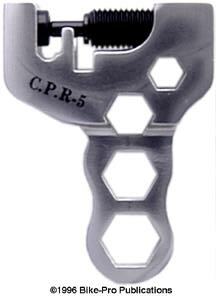 The adjustable wrench is Silver in color with all other steel parts having a Black color. The adjustable wrench can be used to hold 4 other optional tools, three are headset wrench tools sized 32mm (1"), 36mm (1 1/8") or 40mm (1 1/4"). 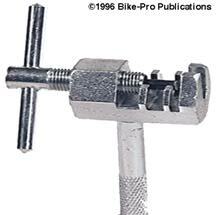 The fourth is the Bottom Bracket lock ring spanner.